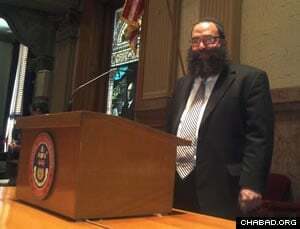 Rabbi Yossi Serebryanski, raised and educated in Australia, has served as a guidance counselor and personal mentor to hundreds of students during his seven-year tenure at the Rabbinical College of America in Morristown, N.J. Rabbi Serebryanski is known for his sensitivity and depth of caring, qualities he utilizes in bringing the richness of our tradition to Jews of all backgrounds in a warm, tolerant, and friendly manner. Mrs. Chana Serebryanski, a Boston native, has been an educator and social service volunteer for over a decade. the strength and focus of her educational philosophy is to approach each student, young or old, at her or his own level. She has organized and successfully launched lecture series, summer camps, Hebrew schools, and a host of women's activities. Mendel Serebryanski has been working at Chabad of South Denver since birth. Raised in Denver, he is currently learning at out-of-state locations, but periodically shows up to add additional life and vibe at Chabad. Shaina, Perel, and Chaya Serebryanski have also been working at Chabad since birth. A band of energy, they actively work at Chabad, and participate in set-up of meals and events. And of course, our student boards, who spend their extra time to help us out at Chabad of DU and beyond, to the wider Jewish community of Colorado! Contact us if you are able to provide assistance or want to volunteer help and effort. Click here for our mission and vision.